Five-time Grand Slam champion Maria Sharapova has had her two-year doping ban reduced to 15 months. The 29-year-old, who has suffered from persistent shoulder injuries, admitted in March she had tested positive for meldonium at January’s Australian Open. A two-year ban was imposed by the International Tennis Federation in June, back-dated to January, and she appealed to the Court of Arbitration for Sport (CAS) seeking a reduction. A 24 month would have meant her missing two years out of the sport, which would almost inevitably had led to her retirement. But now she can return on April 25, which puts her in position to make her comeback at the French Open at Roland Garros in May. 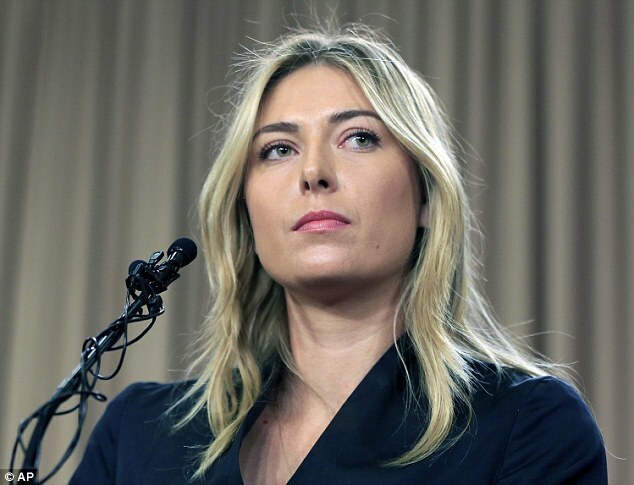 The Switzerland-based arbitration panel said they had ‘found that Ms Sharapova committed an anti-doping rule violation and that while it was with ‘no significant fault’, she bore some degree of fault, for which a sanction of 15 months is appropriate’. Sharapova said today: ‘I’ve gone from one of the toughest days of my career last March when I learned about my suspension to now, one of my happiest days, as I found out I can return to tennis in April. Sharapova was born in Russia but moved to the US in 1994, now lives in Florida and is a US citizen. Sharapova, who won a silver medal at London 2012, was forced to sit out the Rio 2016 Olympics after the appeal was postponed. Sharapova argued she had been using a Latvian-made heart disease drug under medical advice for a decade and had not realised it had been added to the World Anti-Doping Agency’s banned list on January 1, 2016. But an ITF disciplinary panel dismissed this explanation, pointing out meldonium had been on WADA’s ‘watch list’ of controversial drugs for over a year and there had been numerous warnings to athletes about it becoming prohibited in late 2015. She won her first Grand Slam title at Wimbledon in 2004. Two years later she won the US Open and then in 2008 the Australian Open. She won the French Open in 2012 and again two years later. Last year she reached the final of the Australian Open again but lost in straight sets to her nemesis, Serena Williams. This year she was knocked out of the Australian Open, again by Williams, and it later emerged she had tested positive for the drug in Melbourne. She broke up with her boyfriend, Bulgarian tennis player Grigor Dimitrov, last year and he is now dating Nicole Scherzinger.